Booksellers offer their views on the San Francisco Fair. This month, two booksellers have been kind enough to share their written observations from the recent San Francisco Antiquarian Book Fair. 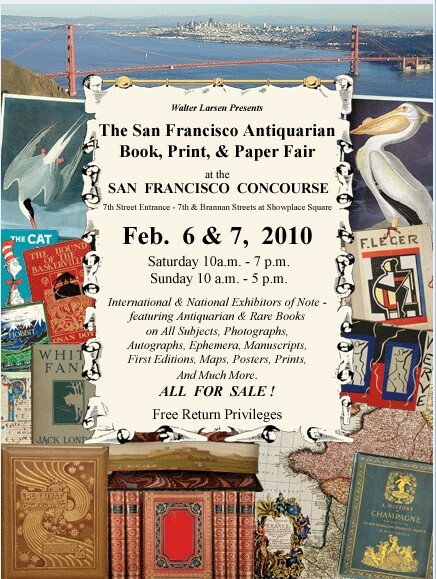 One, Susan Halas, of Prints Pacific, Maui, Hawaii, attended as a visitor, the other, Chris Lowenstein, of Book Hunter's Holiday, San Mateo, California, was a vendor. Interestingly, their observations were somewhat the reverse of what I expected. It's hardly news that book fairs are not performing as well as they once did. With the current recession now tacked onto what had been a general decline, many see fairs as an endangered species. However, participant Chris was, for the most part, pleased with the results. Visitor Susan, on the other hand, was disappointed. That a seller would be pleased with a fair's performance today is good news and somewhat surprising. What we weren't expecting to hear was that a visitor was disappointed. Maybe that isn't bad news. If visitors are disappointed, there is room for improvement, and if there is room for improvement, there is room for increased sales. So, if you are a bookseller, you should listen carefully, especially to criticism, as a pat on the back will do you no good. Here we have thoughts from both booksellers, starting with those of Susan, the observer. "I tried to visit every booth. I saw much to admire and covet," comments Susan. "I saw little or nothing to buy. There were however many wonderful people who I finally got to meet in the flesh." To intersperse a little editorial commentary here, there was much to admire and covet, but almost nothing to buy. How is this possible? I'll go out on a limb and say price is a major issue. Booksellers should take notice. Some are adjusting prices to the times, others are waiting for time to readjust prices. That is the individual seller's call, but it's a mistake to send a willing buyer away empty handed. If books are too expensive to collect, there will be no collectors. So, if you don't choose to lower prices on your best material, then bring something along the not-so-wealthy dealer or collector can afford. Few new collectors start at the top end of the price spectrum. Every young, potential new collector who walks out the door thinking that books are too expensive represents a failure for the trade. Now, we return to Susan's own words for some excellent marketing advice from someone who has spent forty years in sales, "from a blanket on the ground at the swap meet to selling commercial properties for millions of dollars." "I hated the lighting. Almost all of the booths with rare exceptions were dark and gloomy. It had the ambience of an aquarium. Most of it had the pizzazz of the very back of your darkest closet." A century ago, the great collectors had their dimly lit libraries, filled with dark colored furniture, bookcases, and bindings. It evoked class. People don't think that way anymore. They like brightness and light. Darkness and gloom is a turn off.